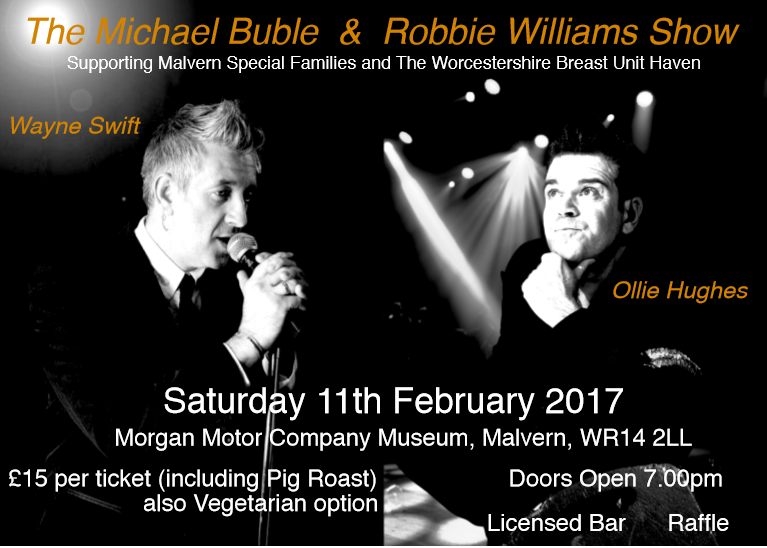 Come and join us for a fabulous evening on Saturday 11th February at The Morgan Motor Company Museum in Malvern, fundraising for two charities – Malvern Special Families and The Worcestershire Breast Unit Haven. The evening will involve the fantastic Ollie Hughes, the best Robbie Williams tribute in the business and Wayne Swift the best Michael Buble tribute in the business. There will also be a disco, pig roast (vegetarian option available), raffle and auction. Tickets are limited. Please contact Tamsin Bayliss on Tamsin_bayliss@hotmail.co.uk if you’re interested.